The Viking Trail is the largest themed highway in Newfoundland and Labrador. 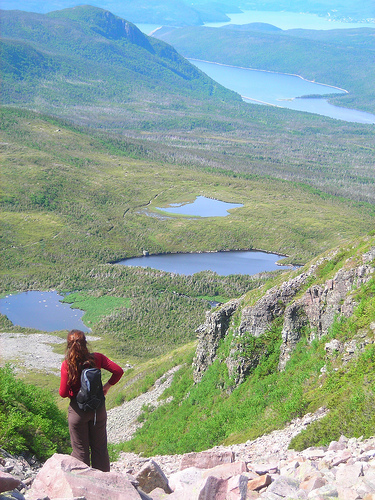 Stretching all the way from the Newfoundland’s west coast to Southern Labrador, the Viking Trail is the only route to the popular UNESCO World Heritage sites at Gros Morne National Park and L’Anse aux Meadows National Historic Site. These northern coastline environments were once home to numerous ancient cultures that now reveal their lives in ongoing archaeological digs and at modern exhibits and interpretation centres operated by Parks Canada and others. Today, scenic fishing communities surround this Northern Peninsula where the Long Range Mountains expose geological wonders. This is a land where some of the planet’s rarest plants grow, where wildlife abounds in the forests and mighty salmon dominate the streams. Visitors will be at the foot of creation, where 10,000 year-old icebergs shine on the horizons while numerous whales migrate in their wake, and Atlantic Canada’s tallest lighthouse helps with the view.